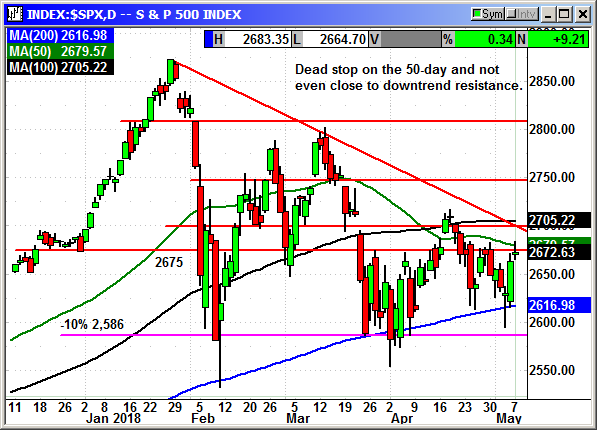 The major indexes tested resistance again on Monday and all failed, at least temporarily. The market had a good rally going until President Trump tweeted he was going to announce his decision on the Iran nuclear deal at 2:PM on Tuesday. The markets rolled over and gave back 50% of their intraday gains. However, with the Dow gaining 95 and the Nasdaq 55 it was still a good day. The real conviction test will come on Tuesday ahead of the Iran announcement. If investors expect Trump to back out of the deal, the market will likely trade lower on a lot of uncertainty. If the U.S. remains in the deal the markets should celebrate retaining the status quo. While that decision will come back to haunt us 10 years from now, investors are only worried about the market today. 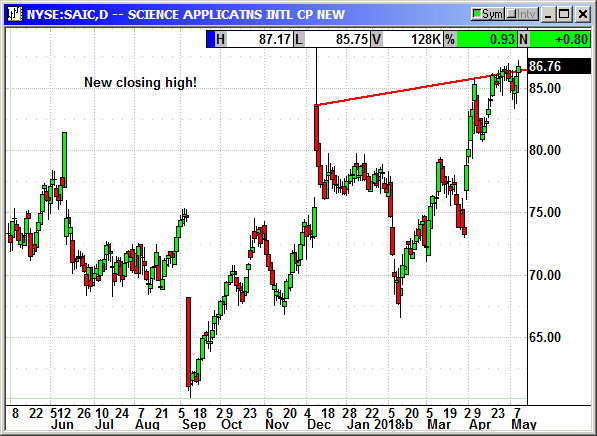 Earnings continue to be very positive but most analysts are warning the good news is already priced into the market. With Q1 earnings near 25% and Q2 expected to grow 22%, there should be some expectations left to price. The 800 pound gorilla left to report this week is Nvidia after the bell on Thursday. The other notables are Electronic Arts, AmBev, Bookings, formerly known as Priceline, Budweiser and Symantec. 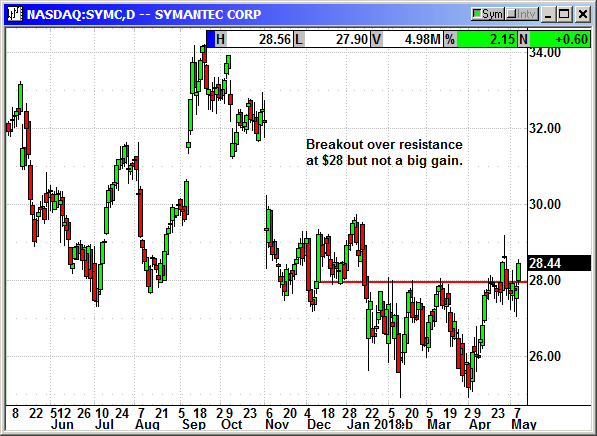 We have a position in Symantec and we will be holding over the earnings report. 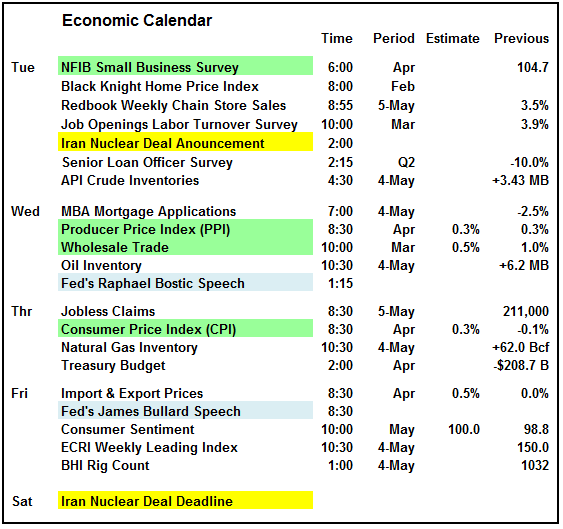 The NFIB Small Business Survey is the biggest report for Tuesday but it will probably be ignored with a flurry of competing headlines on the nuclear deal. The S&P posted a solid 9 point gain but it came to a dead stop on the 50-day average intraday. This is also the same area as the 2,675 resistance that has held the index back for the last month. This is going to be a challenge to overcome these levels and move over the prior resistance high close at 2,706. The 200-day remains firm and as long as that does not break the market will eventually rally. 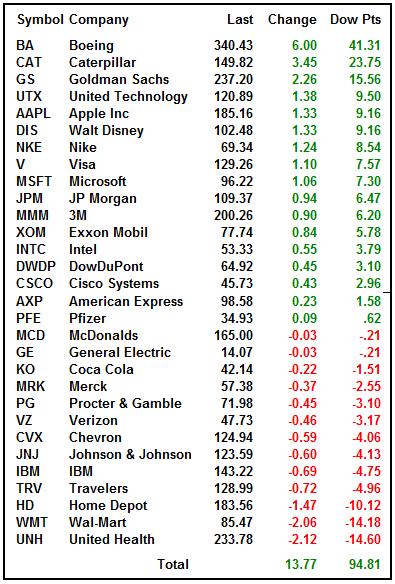 The most oversold stocks in the Dow have been the biggest gainers over the last three days. That is to be expected. 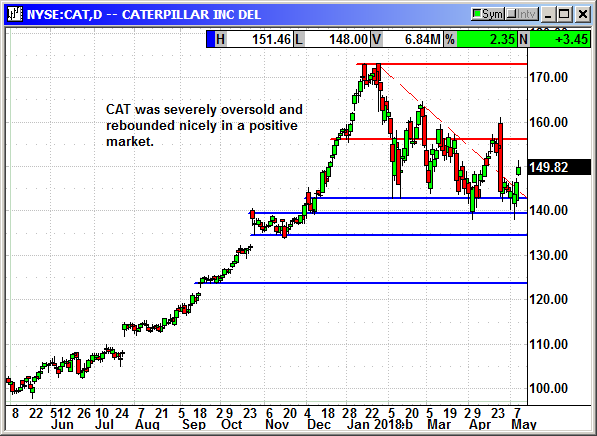 Boeing and Cat were positively crushed over the last month and they were due for some bargain hunting. 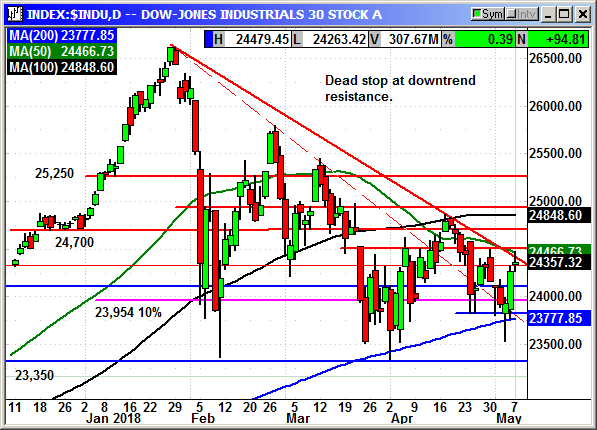 The Dow came to a dead stop at the 50-day average and downtrend resistance before giving back 120 points intraday. The Dow chart is still bearish until we get a close over 25,000. 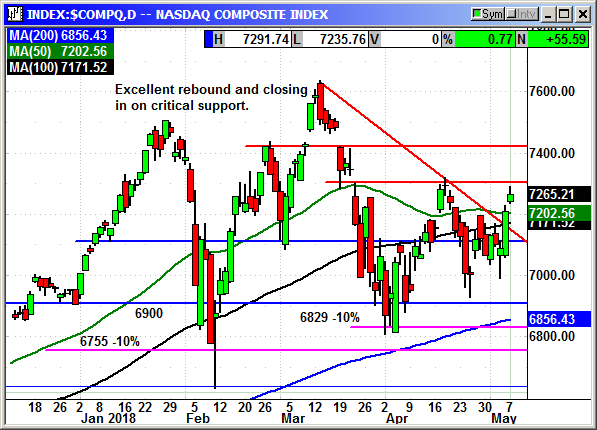 The Nasdaq Composite is nearing critical support at 7,300-7,306 and a move over that level should trigger some price chasing. 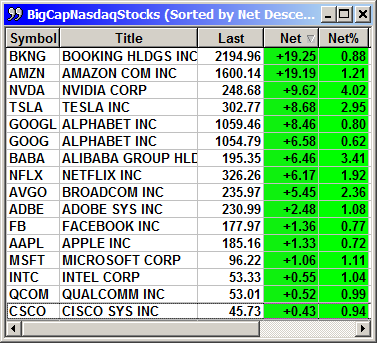 All the big cap tech stocks were positive and only three posted less than a $1 gain. 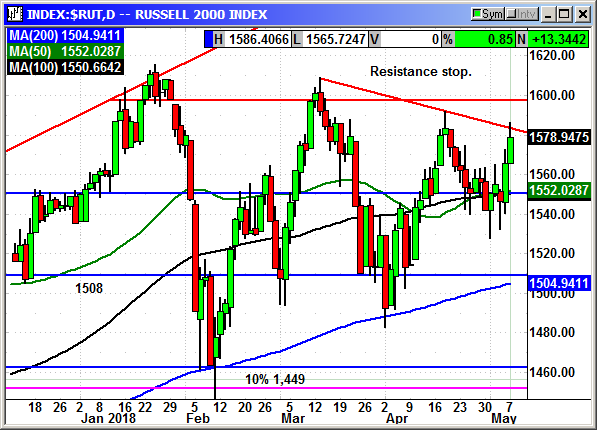 The small cap Russell is actually the best performer and is moving closer to the psychologically important 1,600 level. That is not the resistance highs but this is where the sellers began to appear on the last trip higher. Rising small caps is a bullish sign. Tuesday is another one of those days where we should wait patiently on the sidelines until after the president speaks. If you jump in ahead of time you have a 50% chance of being wrong and the post speech move could be strong in either direction. I am encouraged about the gains on the Russell and Nasdaq but the Dow and S&P are still in bearish descending triangle patterns. Until those levels are broken, the market sentiment should remain bearish. 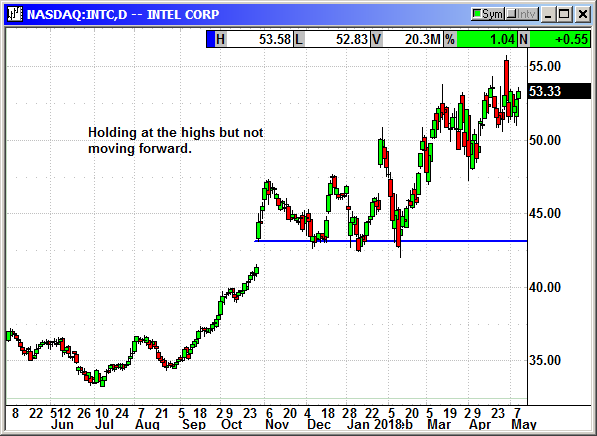 Buy August $75 call, currently $4.30, initial stop loss $68.85. 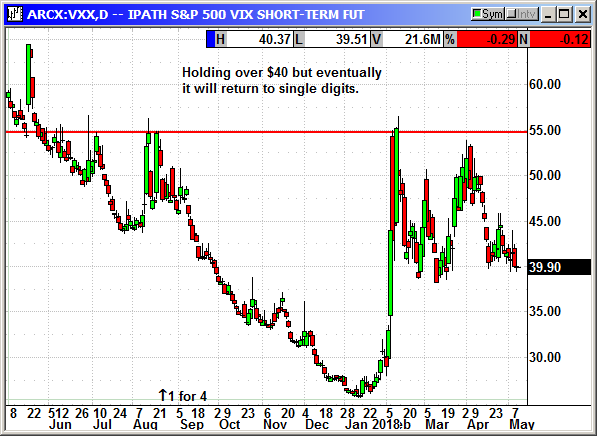 The long call position was closed on Tuesday. 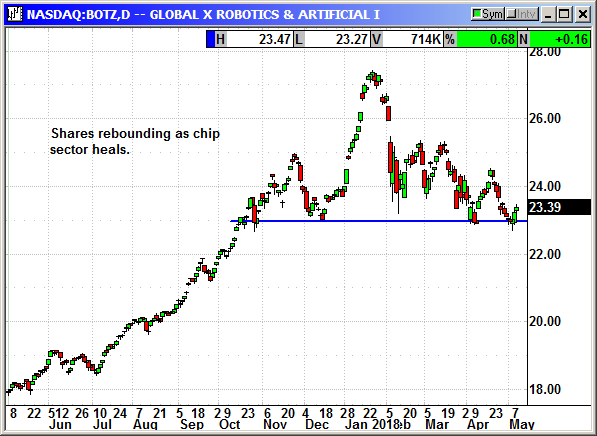 The chip sector is starting to recover and BOTZ rebounded from support. 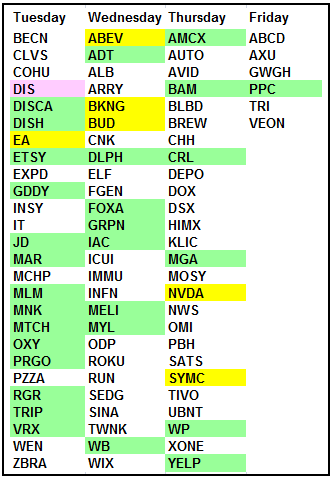 With Nvidia earnings this week, the sector is likely to trade sideways until after the event. Caterpillar will present at the Wells Fargo Conference on Tuesday at 8:35 ET. 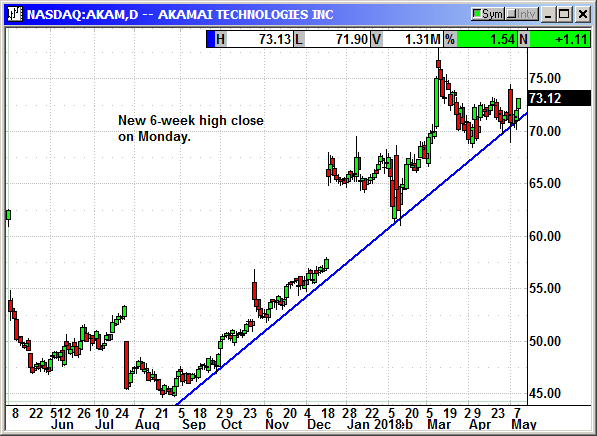 The stock has been very oversold and it was a leader in today's rebound. 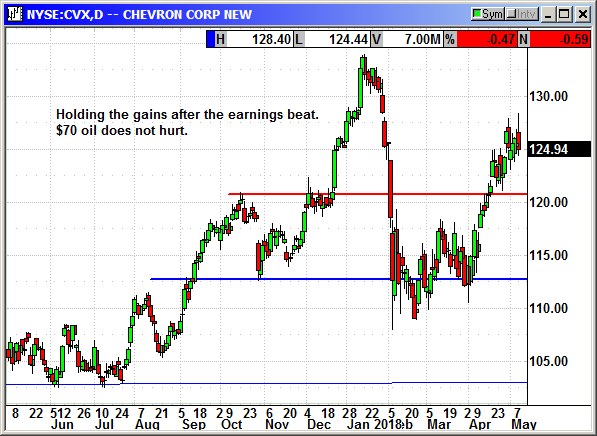 Chevron is holding at the recent highs but everything depends on President Trump's decision on Iran at 2:PM on Tuesday. Late after the bell today, Qualcomm said it was shutting down its datacenter chip effort and would either shutter the unit or attempt to sell it. Qualcomm just started selling its first server chip, the Centriq 2400 last year and customer acceptance has been lacking. Intel has a 99% market share in the server chip market and releases new higher end chips constantly and for Qualcomm to try and keep up using the limited ARM chip, it would have been an expensive and time-consuming battle. This should give Intel a boost on Tuesday. We closed the position at the open on Tuesday. 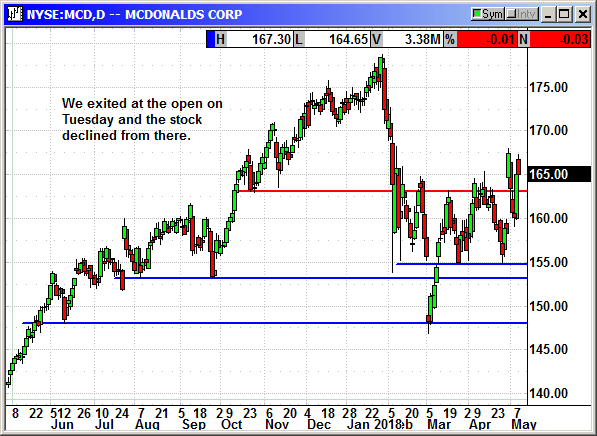 Update 4/30: McDonald's reported earnings of $1.79 compared to estimates for $1.67. Revenue was $5.14 billion and beat estimates for $4.97 billion. Global same store sales rose 5.5% compared to estimates for a 3.6% rise. US same store sales rose 2.9% and matched estimates. This is a May option so I am recommending we close the position. 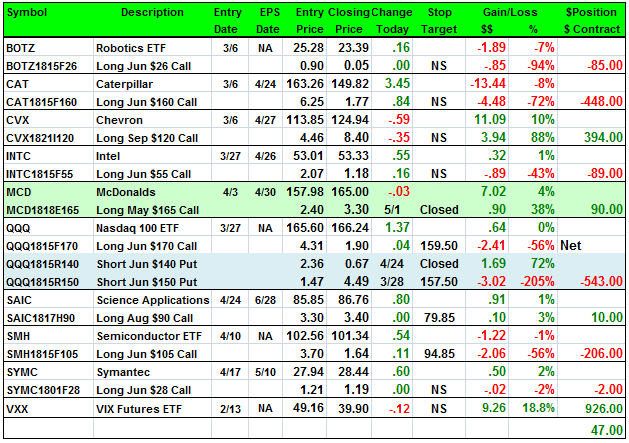 Closed 5/1: Long May $165 call @ $2.40, exit $3.30, +.90 gain. Excellent rebound after Apple reported earnings. 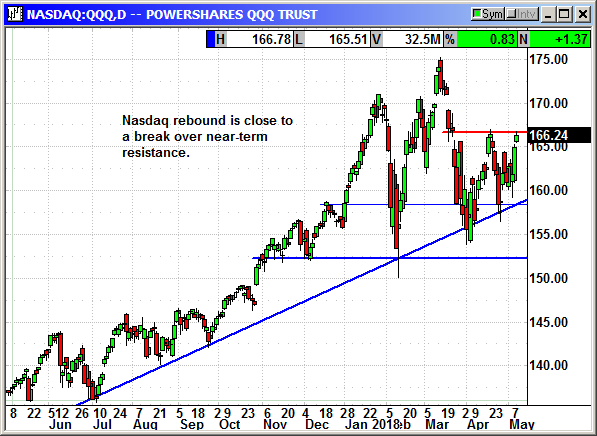 The QQQ is very close to breaking over near-term resistance. No specific news. New closing high on Monday. 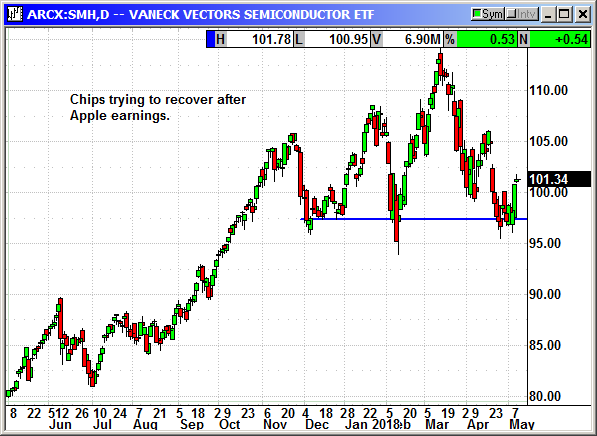 Apple came through with their earnings and the chip sector is trying to rebound. However, with Nvidia earnings on Thursday, the sector may be listless until after Nvidia reports. With more than one million wells in the U.S. and several hundred thousand miles of pipelines, big oil companies are at risk of a major disaster. These companies are digitizing but it is a long slow process and the new networking of these assets is far from secure. Oil companies tend to move slow in electronic technology because of the expense of renovating their infrastructure. Deloitte reported last year that oil companies were the second most popular targets for cyberattacks in 2016 and it was only getting worse. Volatility is starting to decline and should continue lower if the market would just continue to stabilize.